P005 / "Tubelite's P1568" = 1" diameter x 7" CTC offset. - fastened with a 5/16 - 18 thru bolt. ABF156 / "Tubelite's P1564" = 1" diameter x 8" CTC offset. - fastened with a 1/4- 20 thru bolt. ABF157 = 1" diameter x 10" CTC offset. - fastened with a 5/16 - 18 thru bolt. ABF158 = 1" diameter x 12" CTC offset. - fastened with a 5/16 - 18 thru bolt. Plase Call to order Any Pull Type Configuration you can imagine. Single or Back to back mounting available. *US32D Only available by Factory order. *US32 Only available by Factory order. *US3 Only available by Factory order. ARM3311 - 1 1/4” diameter with custom center to center offset pull handle. Each pull handle is fastened with a 5/16 - 18 x 2 1/2" Heavy Duty Thru Bolt / Button Head Cap Screws for long lasting application. 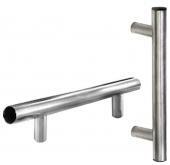 Offset posts are available in both US32D 316 satin stainless and 316 stainless with dark bronze powder coat. Stainless Pulls Have Black Capped Ends. The Sold Aluminum Pulls Have Painted Ends. Minimum length is 18" overall, which is 12" Center to Center. Maximum length is 120" overall, which is 114" Center to Center. Center To Center is Overall Length Minus 6 inches for a standard deduction. 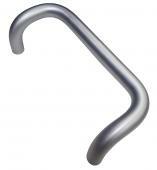 Recommended to add a mid post to pulls with an overall length of 84" of greater. 18" overall Through 96" overall comes standard with 2 offset posts. 96" overall Through 120" overall comes standard with 3 offset posts (Already has 1 Mid Post). 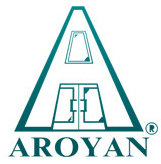 Any pull with over 2 mid posts ( 4 offset posts total ) Please contact Aroyan for pricing and ordering. ARM3301 - 1 1/4” diameter with custom center to center straight pull handle. Each pull handle is fastened with a 5/16 - 18 x 2 1/2" Heavy Duty Thru Bolt / Button Head Cap Screws for long lasting application. All glass doors come with a decorative thru bolt for single pull applications. Straight posts are available in both US32D 316 satin stainless and 316 stainless with dark bronze powder coat.